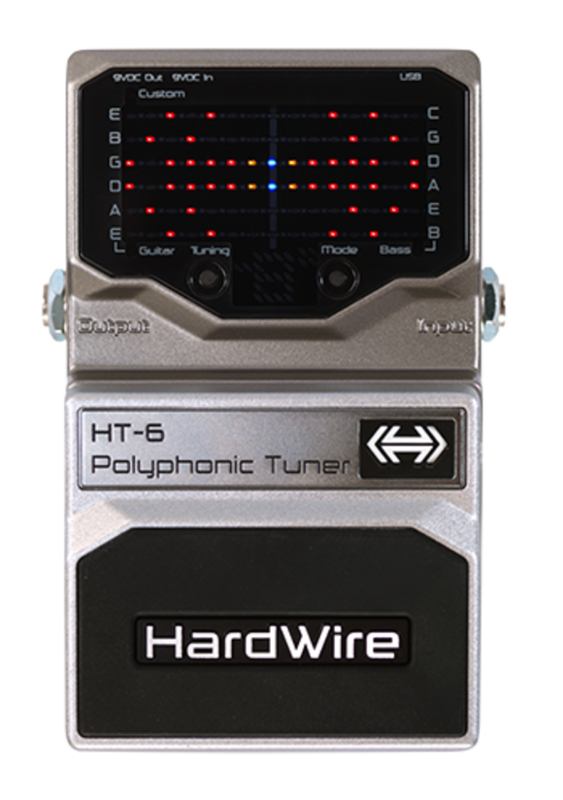 HardWire®, a leading manufacturer of guitar pedals, is introducing the new HT-6 Polyphonic Tuner at the 2011 Winter NAMM show in Anaheim, California. The HT-6 is a tuner for guitarists and bassists that can be used to tune all 6 strings of an instrument simultaneously. Based on technology from 3dB Research, the HT-6 makes tuning instruments faster and easier easy by simply strumming all strings and viewing the string display readout as to which string is in or out of tune. The HT-6 Polyphonic Tuner pedal interface is similar to chromatic tuning pedals but features standard effects pedal. 6-rows of LED lights, one for each string. LED display matrix that represents the six strings of a guitar or bass. Two buttons on the HT-6 Tuner's top display panel are used for selecting display modes (Mode) and tuning references (Tuning). The HT-6 also features individual guitar and bass LEDs to indicate whether guitar or bass display modes are being used. The Custom LED will light when Drop D tuning reference is selected. There is a cluster of LEDs below the matrix that is used to display the note as individual strings are tuned. The HT-6 can also be used as a standard single string tuner. The HT-6 runs off of a 9VDC battery, or an optional external Harman PS200R DC power adapter. The HT-6 can also power up to six other 9VDC powered pedals on your pedal board when used with an optional DC power adapter and a power chain cable. "The already impressive lineup of HardWire pedals just got even better with the introduction of the HT-6 Polyphonic Tuner. The tuning capability of the HT-6 is a great addition to a tour-worthy package of the HardWire pedals," stated Rob Urry, president, Harman Music Group. Each HardWire pedal also features an assortment of tour-worthy accessories, including green gaffer tape common to pro pedalboards, and a precut hook and loop pad to mount the pedal to a pedalboard.